Ruby garnet color. Bright aromas and flavors of spiced cherries, toasted fruit cake, and chocolate nuts with a silky, bright, fruity medium body and a smooth, interesting, breezy finish with accents of pickled beet, apple, and hint of licorice with no oak flavor. A nicely crafted pinot noir with good balance and varietal character. Bottom Line: A nicely crafted pinot noir with good balance and varietal character. 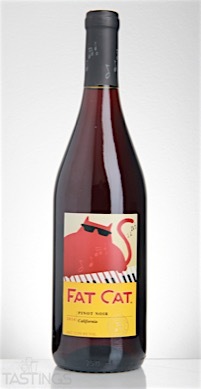 Fat Cat 2014 Pinot Noir, California rating was calculated by tastings.com to be 88 points out of 100 on 5/3/2016. Please note that MSRP may have changed since the date of our review.